(... and a Nuke Plant!). Its about dam time! A West Georgia Dam Quest! I guess the kids got tired of us talking about bagging Hoover Dam, but never doing anything about it. Marisa and Mike bought us plane tickets to Las Vegas for Christmas, and said "put up or shut up!" So, on January 12 we boarded the plane for Vegas. As expected, commercial flying is no fun anymore, but once there we hopped in our rental car and headed to Boulder City, where we had reserved a room. We got there well before dark, and Hoover Dam was only about 5 miles or so away, so we ran a reconnaissance mission to see what we could see. In a word... WOW! So began a whole new quest for us. It was different in many respects: we didn't have our usual van-load of "support stuff"; in fact, we were pared downed to 4 bags, one of which was the camera bag. That took some doing! But as it turned out we had pretty much every thing we needed. We sort of winged it as we went, but from the heading you might guess that we managed to visit Goldstone. For those unfamiliar, this is one installation of the Jet Propulsion Laboratory's "Deep Space Communication Complex". We were there the day they rolled Spirit off of the lander on to the surface of Mars. While this particular installation might not have the glamour of "mission control", there was still the enthusiasm and excitement, and the knowledge that this is where the signals are dug out of the muck and noise, cleaned up, and sent to mission control so that those guys can do their thing. So now, we have 12 rolls of film to develop, a lot of scanning and page work to do, but check back soon for the trip report and a lot of new stuff! After well over a year of letting the page stagnate, we are finally getting around to freshening things up a bit. It's been a trying year, to say the least; on April 28, we joined the ranks of those who have suffered a house fire. We were out of the house just 2 days shy of five months, which was totally ridiculous: we made the wrong choice when it came to the recovery service. Fortunately, the insurance company (I'll give them a plug immediately: Georgia Farm Bureau!) has done what they could to help us through this mess. We lost almost all of the computer equipment, which is one reason it has been so long since we updated the page. That's also why the local weather page, and the private family page, which both existed on the ke4ikc.com server here in the house, went away. We'll try to add some details in a future update so that maybe some folks facing the same situation can avoid some of the mistakes we made. In the meantime, if you would like to ask us something or just need a shoulder to cry on, email us. In between that and work, we haven't been able to do any quests until just recently. We took a long weekend after Thanksgiving and went to our favorite vacation spot, Desoto State Park, for a few days. That turned out to be a mixed bag. Right after we visited the park last time, about two years ago, they suffered an ice storm that pretty much broke every pine tree in the place, then the pine beetles moved in to finish them off. The park almost looks like it has been logged in places. But we were there when there was no foliage on the surviving plants, so hopefully things will look nicer come springtime. We did manage to snag a new dam on this trip. Weiss Dam, an Alabama Power Company Dam, impounds Lake Weiss in northeast Alabama, extending a little ways into Georgia. This turned out to be a very interesting dam, as we were pleased to discover during the "web reconnaissance" before the trip. It was impossible to adequately photograph from the ground, but we hope we got an interesting shot or two. We also drove the Little River Canyon Rim Drive this time, but in the other direction: from the mouth to the falls. This gave the new family truckster (we finally retired the Caravan and replaced it with a Mazda MPV) a good workout, but it did well. We also stopped by Carters Dam on the way up. For some reason we did not have a good shot of the face of the dam. It was a beautiful sunny afternoon, so we thought we would try to remedy that. We went down the powerhouse access road, which fortunately is not gated, and got a great shot of the dam in the afternoon sunlight. For some reason or other, I just haven't been in a web page updating mood. But everbody wanted to see me in a tux, so here it is! Take a good look, for this is probably the ONLY time you will ever see that! Photo taken by Myra Mooneyham of Newport, TN, the "official" photographer for the event. 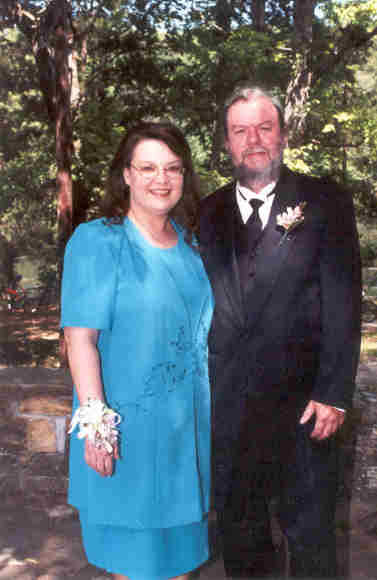 On Saturday, June 1, 2002, David and Rebecca tied the knot at Cumberland Mountain State Park at Crossville, Tennessee. It was a blast, and I (Pat) have been told I had entirely too much fun! Maybe, but a fine time was had by all, and welcome to the family, Rebecca! Kudos to Bob and Louise Benvenuto, the proud parents of the bride, and to all of us for getting it done! Someone had the forethought to hit a one-hour lab, and get a few shots to share, before the "official" pix come back (and we get the 8 rolls we have and 9 one-use cameras developed!). 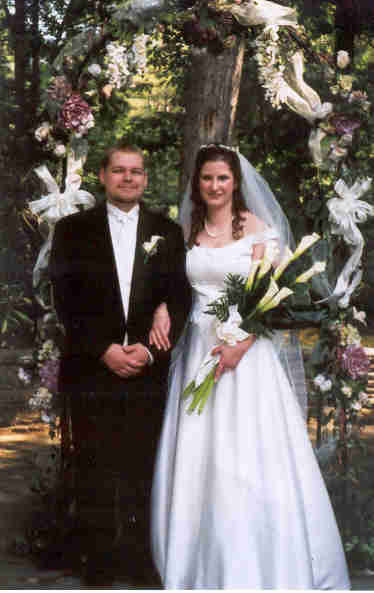 So, until the all the pix come back (and a lot of scanning is done) here is the happy couple. We just re-upped the site at Pair, so we will be here for at least another year. In the meantime, we are still waiting to see if our overhaul will allow us to get picked up by the search engines. We made one last quest for the season, probably, to bag some Corps of Engineers Dams on the Cumberland River system near Nashville, TN, and added Edgar Evins to the State Park list.